Turkish intervention in Iraq is driven by sectarian concerns and ambitions. In a span of five years Turkey has had serious political and military tensions with several countries in its vicinity: Israel, Syria, Russia, Jordan, Egypt, Cyprus and Greece. Most recently, Iraq has also joined the club of hostilities surrounding Turkey. Despite the Iraqi government's vehement requests that Turkey withdraw its troops in Iraq, Ankara shrugs it off and says it will maintain its military presence in the neighboring country for "Iraq's stability." What a nice neighborly gesture! Behind the Turkish indifference lies sectarian concerns and ambitions. On October 1, Turkey's parliament extended the mandate of Turkish troops deployed in Iraqi territory by one more year. 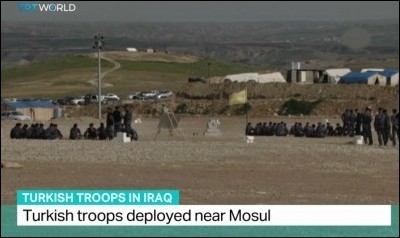 The troops are stationed near Bashiqa in northern Iraq -- as unwanted guests. That sparked a row with Baghdad and may further complicate the cold sectarian war between the Sunnis in the region, supported by Turkey, Saudi Arabia and Qatar, and their Shiite enemies, supported by Iran and the Shiite-controlled government in Baghdad. Iraqi Prime Minister Haider al-Abadi renewed the call for the withdrawal of Turkish soldiers from his country and warned that Turkey's military adventurism could trigger another war in the Middle East. He said: "We do not want to enter into a military confrontation with Turkey ... The Turkish insistence on [its] presence inside Iraqi territories has no justification." The Iraqi parliament said in a statement: "The Iraqi government must consider Turkish troops as hostile occupying forces." Turkey's pretext that its troops are in Iraq to 'fight ISIS' doesn't convince anyone. Baghdad has also requested an emergency meeting of the United Nations Security Council (UNSC) to discuss the issue. The UNSC should "shoulder its responsibility and adopt a resolution to end to the Turkish troops' violation of Iraq's sovereignty," said Ahmad Jamal, spokesman for the Iraqi Foreign Ministry. The Turkish move does not annoy only Iraq, but also its Western allies. Col. John Dorrian, the spokesman for the US-led coalition of 65 countries that fight the Islamic State (ISIS), said that Turkish troops in Iraq are not acting as part of the alliance. Dorrian said that Turkey is operating "on its own" in Iraq. He added that the coalition position is that every unit "should be here with the coordination or and with the permission of the government of Iraq." By October 9, things started to get more annoying. Iraq's Ambassador to Turkey, Hisham Alawi, said: "If we do not reach some result, the Iraqi government will be forced to consider other options, and by doing so, Iraq would be practicing its right to defend its sovereignty and Iraq's interests." Turkish Prime Minister Binali Yildirim says his government's use of force in Iraq is designed "to make sure that no change to the region's 'demographic structure' is imposed by force." Ankara remains defiant. Prime Minister Binali Yildirim said that Turkish troops would remain in Iraq. Turkey's pretext is that its troops are in Iraq to "fight ISIS." That does not convince anyone. Turkey's intention is largely sectarian (read: pro-Sunni) and Yildirim admitted that in a not-so-subtle way when he said that the Turkish troops were in Iraq also "to make sure that no change to the region's 'demographic structure' is imposed by force." Turkey fears that the aftermath of a planned assault on Mosul, Iraq's second largest city and ISIS's Iraqi stronghold, could see a heavy Shiite and Kurdish dominance in the Mosul area. Turkish Foreign Minister Mevlut Cavusoglu said: "Involving Shiite militias in the operation [against IS] will not bring peace to Mosul. On the contrary, it will increase problems." Unsurprisingly Turkey's pro-Sunni Islamists want Sunni dominance in a foreign country. This is not the first time they passionately do so. The problem is that Turkey's sectarian ambitions come at a time when the coalition is preparing a heavy offensive on ISIS-controlled Mosul. Turkey's primary concern is not to drive ISIS out of Mosul but to make it a "Sunni-controlled city" after ISIS has been pushed out. And this ambition jeopardizes the planned assault on ISIS. Turkey's primary concern is not to drive ISIS out of Mosul, but to ensure the city remains Sunni-controlled. Iraqis think that the offensive to retake Mosul from ISIS is unlikely to begin as long as Turkish troops remain in Iraq. "I think that as long as these Turkish troops remain around Mosul, the operation to control the city will not start, or there must be a new agreement for the Turkish force not to take part in the offensive," said Iraqi lawmaker Abdelaziz Hasan, also a member of the defense and security committee at the Iraqi parliament. Turkey's sectarian ambitions in neighboring Syria have ended up in total failure and bloodshed. Now Ankara wants to try another sectarian adventure in another neighboring and near-failed state, under the pretext of "bringing stability." 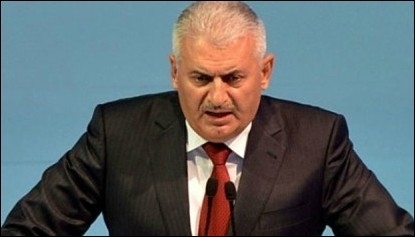 Yildirim said that Turkey "bears responsibility for stability in Iraq." That is simply funny. You cannot bring stability to a country that looks more like a battleground of multiple religious wars than a country with just a few hundred troops.